Improvements in water quality are transforming the lower Saluda's "put-grow-and-take" trout fishery into a must-try-it destination for serious fly fishing and adding to the Midlands river's growing reputation as a hotspot for outdoor recreation. The splash as the large rainbow trout landed after a high leap into the air was loud enough to startle me, the first of three aerials as it sped away in the swift current, trying to pull loose from the small fly on the end of my line. When that maneuver didn't work, it bored straight across the main channel towards a large underwater log that lay parallel to the far bank. I was excited by the weight and power of the trout - its run had bent my lightweight fly rod nearly double. I had hooked the trout on a caddis fly, just a few feet from the upstream end of a riffle running parallel to the log. After not being able to pull free in the swift current or shake the fly loose in the air, it must have decided that the log and its branches provided the next best shot at freedom. It could not, of course, know that I only wanted to land it for a quick photo and a careful release back to the river. The hefty rainbow made several more runs towards the log, each time with me straining my rod and five-pound leader to keep it away. It took a few minutes of playing the trout on the flexible but unyielding fly rod before I could coax it into my net. I moved quickly to a shallower stretch, where I retrieved my camera from my fly vest for a photo, and, after a quick measurement of length, removed the fly for release. What a beauty! I thought as the sunlight sparkled on its silvery body, including the bold red stripe that shone down its entire side. 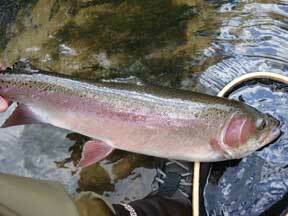 A rainbow measuring just over twenty-four inches in length is considered a trophy trout by most anglers! This one needed little reviving, as netting it let me land it before exhaustion, and it quickly swam down and away in the swift current after I reluctantly let go of its tail. This was one of several dozen rainbow and brown trout larger than sixteen inches - with more than a dozen over twenty! - that I have caught in the past two years. 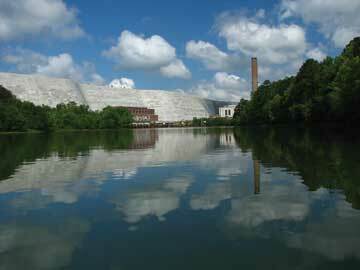 Not, as you might suspect, in the South Carolina Upstate, but in the lower Saluda River below the Lake Murray Dam. 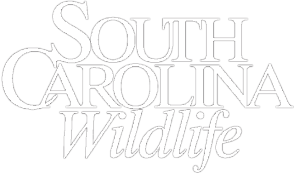 Both species are stocked in this Midlands river each year between December and February by the S.C. Department of Natural Resources. 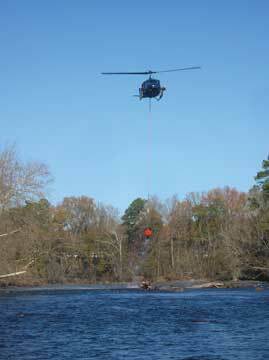 The stocked trout come from the DNR's coldwater hatchery near Walhalla, and the initial stocking is made by helicopter in order to spread the fish along the ten-mile stretch of the lower Saluda River between the Lake Murray Dam and its confluence with the Broad River. That first stocking usually consists of small browns averaging five inches, and rainbows in the ten-to-twelve-inch size range. Subsequent stockings of several thousand more similarly sized rainbows using trucks happen in January and February. 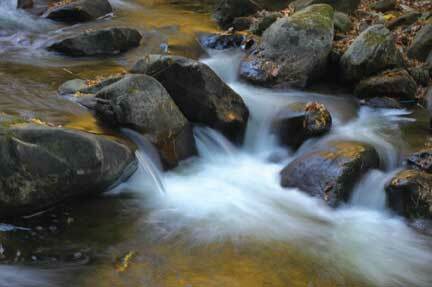 In all, more than 20,000 trout are stocked in the lower Saluda each year. Anglers eagerly look forward to the annual stockings that sustain this "put-grow-and-take" trout fishery. 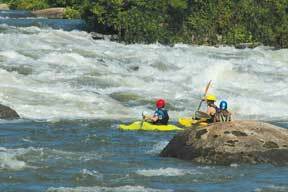 In fact, the lower Saluda is an increasingly popular destination for many types of outdoor recreation, providing an oasis of natural beauty in the center of the highly urbanized Columbia metropolitan area. Its banks are still mostly undeveloped, with tall trees and undergrowth predominating for most of its length. Paddlers on the lower Saluda enjoy access to whitewater boating, as the river sits astride the rocky Fall Line that divides the rolling hills of the piedmont from the coastal plain. The waterway provides habitat for herons, ospreys and even eagles, plus river otters, beavers, deer, turkey and other wildlife. 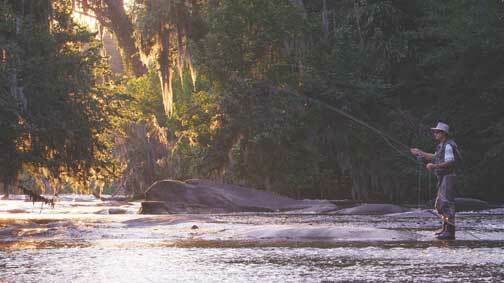 It is a significant water resource that has been recognized by the legislature with a "State Scenic River" designation. But, most prized by anglers is the icy cold water that flows downstream from the depths of Lake Murray, with temperatures ranging year round from the mid-fifties to the upper sixties Fahrenheit - an ideal range for coldwater species like trout, but one that also allows redbreast and other warmwater species to flourish, adding to the Saluda's uniqueness. Known for years for its summer runs of striped bass, attracted to the colder water after the rigors of spring spawning in the warmer Congaree River downstream, the lower Saluda is now also becoming recognized as a significant trout fishery. Catches of trout larger than sixteen inches are becoming commonplace, indicating that some of the trout stocked by the DNR are surviving year-round. That's great news, not only for anglers, but also for the Midlands economy. Numerous studies have shown that healthy freshwater fisheries foster significant economic activity and increase the quality of life for the residents of their surrounding communities. The year-round survival of trout in the lower Saluda is a dramatic and welcome new development in the history of this fishery. From the early 1960s, when the DNR first began stocking the lower Saluda with rainbow and brown trout, until just a few years ago, low levels of dissolved oxygen in the water released from the lake during late summer and early fall created poor water quality for trout. Stocked trout caught in the fall were generally very lethargic, and holdovers, as trout are commonly called when they live for more than a year after stocking, were very rare. Why? The lower Saluda is fed by discharges of water taken from the lake's bottom that flow through the generators in the dam's hydroelectric plant. In summer, the water in the lake stratifies, with a warmer layer forming near the surface and a colder layer developing below, where there is no atmospheric contact and no opportunity for oxygen renewal. Over the course of the summer, the colder bottom layer becomes starved for oxygen. In the past, the colder layer of water on the lake's bottom was often so low in oxygen during the fall that trout, which have higher oxygen needs than other species of fish, could not survive in it. Other species in the river suffered as well, but warmwater fish survive the stress better. Fortunately, stratification of the water levels is only a problem in the late summer and early fall. The lake "turns over" when the weather cools, remixing the water layers that separated during the warm summer months. According to Midlands-area DNR fisheries biologist Ron Ahle, the extent of the low dissolved oxygen problem was first revealed in 1988, when the DNR, the S.C. Department of Health and Environmental Control and Trout Unlimited (TU) jointly funded an Oxygen Dynamics study by USC's School of Public Health. In recent years, some key steps taken by SCANA subsidiary South Carolina Electric and Gas (SCE&G), the utility company that operates the dam and hydroelectric plant, have vastly improved fall water quality in the lower Saluda. After nearly a decade of renovations that began in the 1990s, the company has completed installation of critical, oxygen-producing air vents on all five of the dam's intakes and generators, which is helping the problem. "The turbine vents installed by SCE&Gto help alleviate the low dissolved oxygen problem work well at fairly low release levels," says Ahle, "but at high release levels, dissolved oxygen concentrations can still drop pretty dramatically." But the vents are just part of the solution. SCE&G has also begun maintaining higher minimum water flow levels that provide improved quality and quantity of habitat. The improved minimum flow levels were recommended by DNR and U.S. Fish and Wildlife Service fisheries biologists, and championed by advocacy groups like TU, Congaree Riverkeeper and American Rivers during SCE&G's Federal Energy Regulatory Commission relicensing proceeding, a requirement for the company's continued operation of the dam and hydroelectric plant. The company's new operating license has not yet been issued by the federal government, but SCE&G has already begun following an improved water flow regime identified as needed by a fisheries study that was a part of the relicensing process. "SCE&G has also committed to additional turbine improvements over the ten-year period after the license is issued, to ensure that the new state dissolved oxygen standard is achieved," says Ahle, "and the flow release plan that is part of the settlement agreement should ensure seasonally appropriate flows that will increase available habitat for fish and other aquatic organisms." More information about the FERC relicensing process, including a copy of the final SCE&G/FERC agreement, is available online at: www.saludahydrorelicense.com. Together, these improvements have resulted in water quality enhancements that benefit a wide spectrum of aquatic resources in the lower Saluda, including the trout and the food they eat. "Water quality should continue to improve even more in the future," says DNR's Ahle, as the existing air vents are replaced by more modern and efficient "turbine runners." 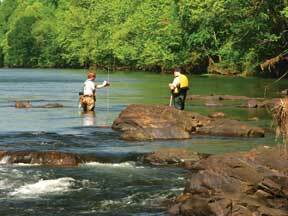 Beginning in late December of 2012, Ahle and other biologists from the DNR's Freshwater Fisheries section will be conducting a growth and mortality study that will help guide future management decisions on the river (see "New Research Planned for Lower Saluda" on page 47). The three-year study will be paid for with federal Sport Fish Restoration Fund dollars collected from the sale of fishing tackle, state license revenues and donations provided by TU's Saluda River Chapter. Conservation groups such as TU, along with the DNR, other state agencies and SCE&G, have worked for years to understand and find solutions to the dissolved oxygen and water flow problems on the lower Saluda. 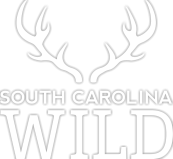 That hard work is now paying off and has kick-started a process that will foster catches of trophy trout by future anglers on the lower Saluda, providing the Midlands of the Palmetto State with a unique, year-round destination fishery that will boost an already growing outdoor tourism market there. This fishery will be even better if Saluda fishermen will continue to practice catch and release trout fishing, or at least limit their creel to less than the allowable daily harvest. 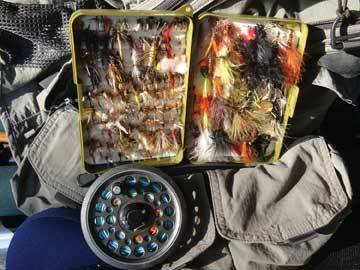 Trout can be taken on many types of lightweight tackle, but the small insects and bait fish eaten by them are most easily imitated with lightweight flies cast by heavy fly lines, which makes fly fishing very effective in drawing strikes, while also being a more challenging and sporting way to fish. Large, wary trout respond well to light flies that resemble their natural foods - like the caddis flies, mayflies and stoneflies that are staples of their diets. A favorite pattern is the "Stimulator," an over-dressed caddis fly often used as a large attractor pattern in sizes of 10 or 12 in combination with a smaller fly. Smaller flies like a "Pheasant Tail" nymph or "Copper John" nymph in hook sizes of 18 or greater, tied approximately twenty-four inches below the attractor (tandem rig), are often taken if the bigger fly is not. 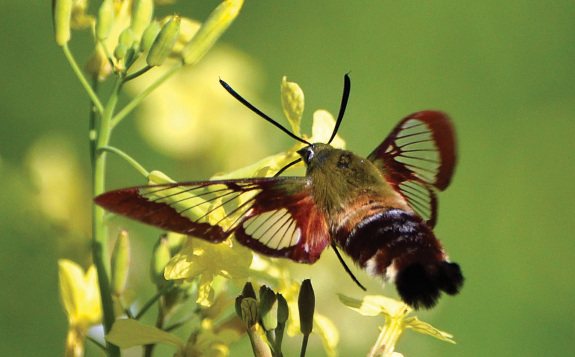 Bulkier flies, like the popular "Woolly Bugger," and streamer flies that imitate baitfish are also very effective, including those that imitate crayfish, hellgrammites or terrestrial insects like beetles, grasshoppers and even the large cyclical cicadas. A landing net allows trout to be caught and released quicker without exhausting them. Also, heavier fly rods and stronger nylon leaders than the typical three-to-five pound test lines used for stream trout allow for better casting of larger flies and quicker landings. In fact, many of the larger trout I have caught on the lower Saluda in the past few years have been taken on gear designed for largemouth and stripers! Spin and bait fishing will certainly catch trout, though often the larger fish are so tuned in to their natural foods that they will not strike anything but flies that closely match those. 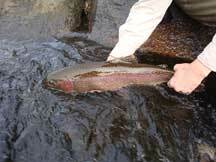 Releases are also easier with single hook flies that usually catch in the fish's upper or lower lips. Not damaging the lips by using barbless flies and gentle handling with wet hands are two techniques that help ensure released trout will grow into even larger trophies. 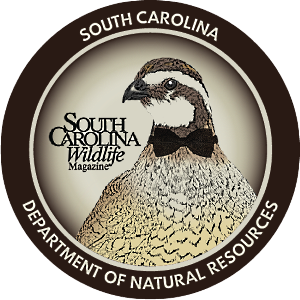 Frequent SCW contributor Malcolm Leaphart has served as chair of the South Carolina Council of Trout Unlimited and was founding president of TU's Saluda River Chapter. A lifelong advocate for stewardship and science-based management of our natural resources, he can often be found engaged in "field research" on Midlands rivers - fly rod in hand.